Documents signed or sealed by the Pennsylvania official who is the custodian of the record. County documents signed by the clerk in charge of the county office. Documents will not be accepted if they are signed by an assistant or deputy clerk. Death Certificates signed by the state registrar. Death certificates will not be accepted if they are signed by a local registrar. Certified copies of Marriage Certificates and Divorce Records issued by Pennsylvania County courthouses. 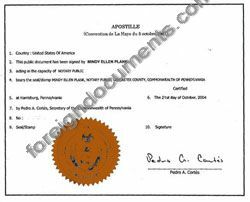 Certified copies of corporate documents: Articles of Incorporation, Articles of Amendment, Articles of Merger, Articles of Dissolution, Certificate of Status issued by Pennsylvania Department of State.